The computers that we use today just about everywhere; be it home, school or workplace are not just productivity tools. They are incredibly advanced machines, made up of numerous equally advanced components and peripherals of all shapes and sizes. And this hardware works in perfect harmony with the powerful software, or the programs/applications of different types to make modern computers the productivity champs they are. If we talk about the hardware, there’s no denying the fact that every single hardware device connected to a computer is equally important, serving a distinct purpose. But there are some devices that are a bit more important due to their inherent purpose, and one of them is the hard disk. That’s because it stores all of our important data (confidential reports, photos, songs, videos etc. ), as well as the software used to manage it, i.e. the Operating System. So it’s imperative that your computer’s hard disk(s) keep working in a perfect condition. And to ensure that, you need to keep a check on things such as fragmentation of files. Now, Windows 10 does a fine job of automatically defragmenting the computer’s hard disk. But what if you want something that offers a little more control, and a couple of options? Not to worry, as there are a number of useful disk defragmenter software applications that you can use. Jumping with excitement already? Let’s find out more about 4 best disk defragmenter software for Windows 10. Coming from the stable of IObit, a company known for a number of its excellent system optimization utilities, Smart Defrag is an insanely feature laden disk defragmenter application that makes sure your computer’s hard disk keeps working the way it’s supposed to. It has a custom defrag engine that not only defragments the disk partitions optimally, but also intelligently streamlines the files stored on the disk based on the frequency according to which they are accessed, thereby enhancing the overall read speeds. But that’s not all. SmartDefrag can automatically clean junk files even before starting the defragmentation process, thus leading to improved disk performance. In addition to that, it can also defragment page file, hibernation file, and even the Master File Table, thanks to its “Boot Time Defrag” feature. Want a simple and to the find disk defragmenter software that’s lightweight, easy to use, and includes just the right number of features? Try Disk SpeedUp, an application that makes easy work of defragmenting your computer’s hard disk, thereby speeding it up, true to its name. 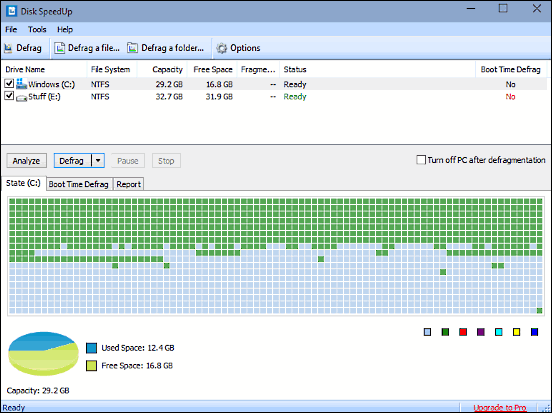 SpeedUp can analyze and defragment hard disk (partitions) either individually, or all at the same time. It represents the data stored on the hard disk (fragmented files, MFT reserved zones, used space etc.) as different colored cubes, which make it easy to visualize how the information is stored across a particular disk partition. Just like Smart Defrag, it also includes boot time defrag functionality, that can defragment everything from the MFT to hibernation file at system startup. In addition to that, Disk SpeedUp can be also used to defragment individual files and folders. In addition to all the regulars, Disk Defrag packs in a number of extra goodies that make it one of the better disk defragmentation utilities out there. The application has a fairly standard UI, that displays a listing of all the detected disk partitions. You can select one or more disks, and analyze them for fragmentation. In addition to the the cluster map, Disk Defrag also displays the list of defragmented files found on the analyzed disk partitions. Once the defragmentation process has finished, Disk Defrag can be configured to automatically shut down the computer as well. In addition to specifying the priority for the defragmentation process, you can also configure scheduled defragmentation. However, the highlight of Disk Defrag has to be the built in “SSD Optimization” feature, that can automatically detect any SSD(s) connected to the computer by optimally reducing the number of write requests made to the disk. For an application that measures next to nothing and is completely gratis, Defraggler packs in an insane number of features that make it much more than just a simple disk defragmenter utility. Coming from the makers of the incredibly popular CCleaner, Defraggler displays a list of all the disk partitions, which can be then analyzed (and defragmented, if needed) either individually, or all at the same time. In addition to the standard cluster map representation of the analyzed disk partition, Defraggler also displays a pie-chart representation of the space consumption of the same. In addition to that, it can also benchmark disk drives. But that’s not the end of the goodies that it comes with. Defraggler can also search for files, based on parameters like file size and strings in file names. What’s more, this thing can even display important characteristics about the hard disk health, such as the temperature, transfer mode, and things like that. Disk fragmentation can have a quite a detrimental effect on not just the hard disk, but the overall working of the system as well. And while the built-in automatic optimization feature of Windows 10 can take care of the fragmentation just fine, the applications discussed above let you have a bit more granular control, and in addition, include a bunch of extra goodies as well. Give them a shot, and let me know your thoughts in the comments below.